I’m raiding the archives of old photo shoots again, because this has always been a favorite of mine, and it was so easy! Meet little Ronald. 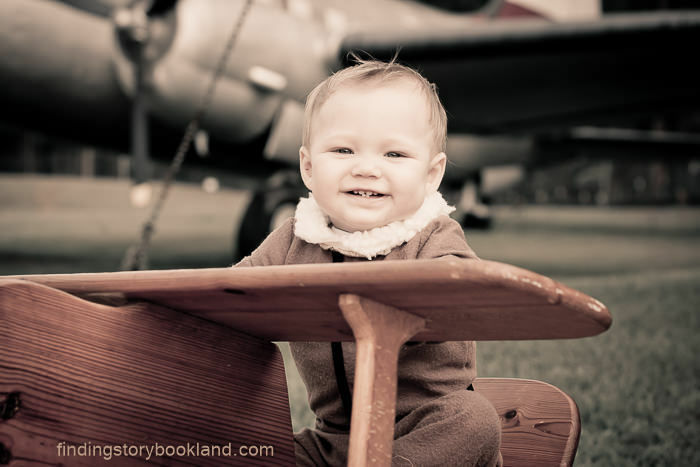 His daddy is a pilot who was deployed at the time of this shoot. As a welcome home, Ronald’s mom and I planned an awesome set of pictures. I still smile every time I see them, and they are two years old! 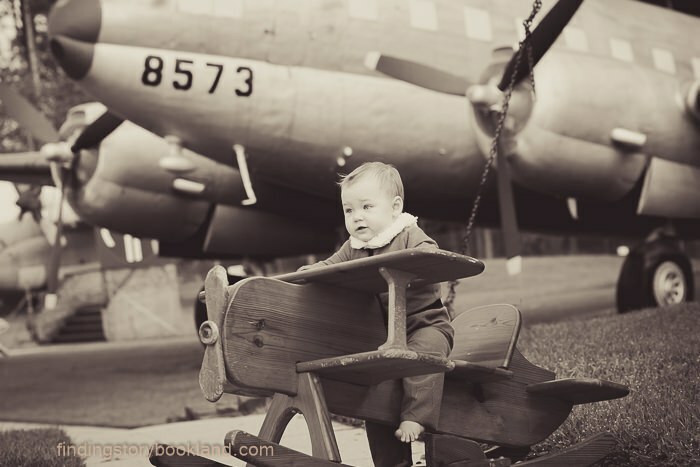 We decided to use an airplane display at the Army base near us as a location, Ronald’s mom did all the costuming magic, and I set myself on a mission to find a tiny plane to use as a prop. 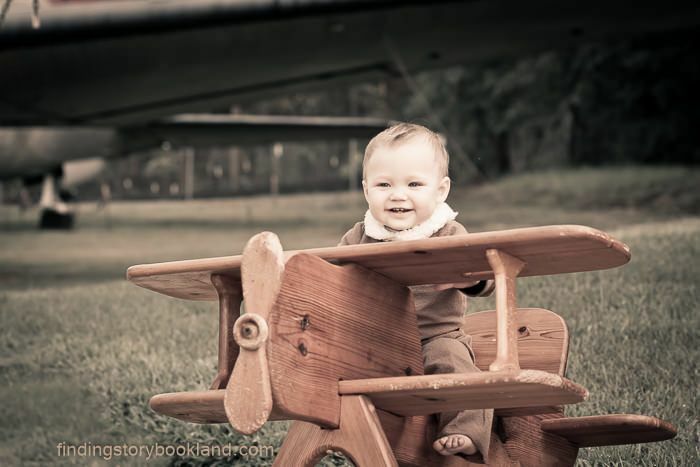 Amazingly, I found a wooden plane rocker on Craigslist for $10 (I’m pretty sure my kids will hang their heads in shame in a couple of years to hear me bragging about all my trips to garage sales and thrift stores, but if I do my job well, they’ll be bragging themselves in about twenty years). Side note, but carrying on with the “budget” theme: the plane has actually been a great prop that I have used several times. After this shoot, we re-painted it red for the Red Baron themed photo shoot. I also used it for a couple of the WWII war bonds posters. 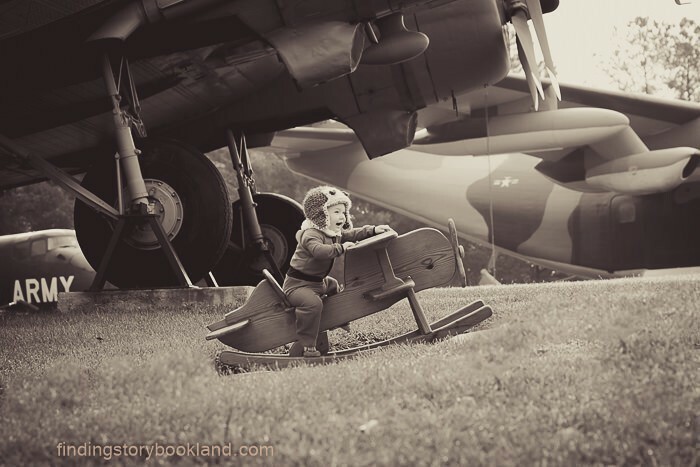 I also envision someday doing a Wright Brothers photo shoot or Amelia Earhart. My son would die and go to heaven if I would paint it orange so he could own Dusty Cropduster. See what I mean? 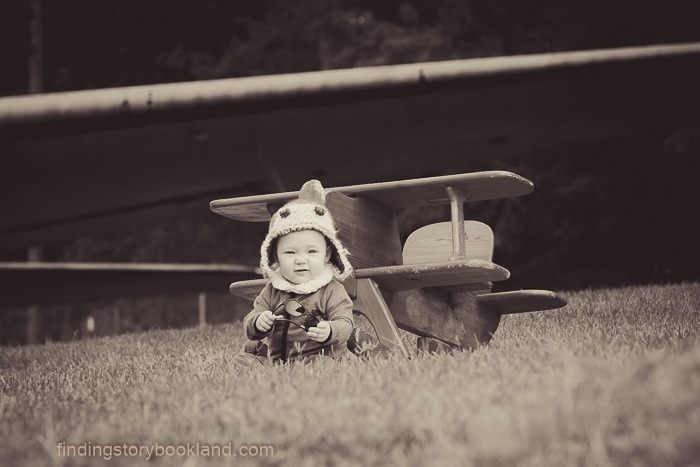 Costumes: Ronald’s mom came up with these awesome bomber pilot jammies and she knitted the aviator hat. Twenty minutes of scouring the internets have not revealed the source of said jammies to me, but ebay is always a good starting place for me when I want a fun and unique costume. And, if you are like me and think knitting needles are frightening, buzz on over to Etsy for all kinds of adorable aviator hats. 1. A slight variation of my WWII Preset.